Embrace nature's solution to our emerging water shortage, and explore all the opportunities that fresh, soft chemical free water offers. 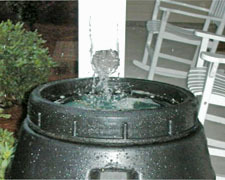 The rain barrel is an invention that has been used for centuries, but in recent years their relevance has become more pronounced. High water bills, global warming and water restrictions have all made the rain barrel more than a gardening tool for those with a green thumb. Because residential irrigation can account for up to 40% of domestic water consumption, water conservation measures such as rain barrels can be used to reduce the demand on the municipal water system or your homes personal well. During a storm, even a light one, it doesn’t take much time for a rain barrel to fill with enough water for your lawn and plants to thrive. We believe the key to conserving and protecting the world's natural resources is research and education. We make it one of our goals to provide as much research, tools and awareness as possible to help conserve our precious resources. We are Rainwater Recycling - Rainwater Recycling Barrels - Rainwater Barrels - Rainwater Recyclers - Rain Barrels - Rainwater Barrels and all things Water Conservation.